By reading this review you can find out all there is to know about a product called Generic Lotrimin Clotrimazole Anti-Fungal Cream USP. 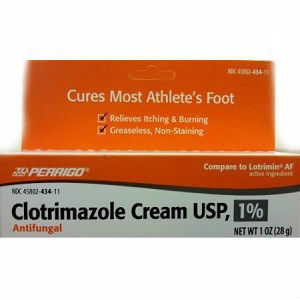 Generic Lotrimin Clotrimazole Anti-Fungal Cream USP is a product which claims to efficiently eliminate all traces of fungal infections which typically afflict the feet, such as tinea pedis (athlete’s foot), tinea corporis (ringworm) and tinea cruris (jock itch). The cream also relieves the symptoms associated with these infections, as well as other uncomfortable ailments of the feet such as various rashes, the cracking or irritation of the skin, the sensation of burning, and soreness. Read on to find out more about the ingredients, dosage and price of Generic Lotrimin Clotrimazole Anti-Fungal Cream USP. The active ingredient of Generic Lotrimin Clotrimazole Anti-Fungal Cream USP is a substance called clotrimazole, which is a synthetic anti-fungal agent designed to eliminate all forms of fungal infections in both humans and animals. Clotrimazole is on the list of the World Health Organization’s list of essential components, and is among the primary anti-fungal agents used in medical science today. The mechanism of function is the inhibition of an enzyme which is essential for the production of fungal cell membranes. The usage instructions for Generic Lotrimin Clotrimazole Anti-Fungal Cream USP are identical to that of any other anti-fungal product. You must thoroughly wash and dry the area you are about to treat. Once the skin has been cleaned sufficiently and has dried, apply a thin layer of Generic Lotrimin Clotrimazole Anti-Fungal Cream USP to the affected area. It is recommended to massage the cream into the skin so that not only the surface of the skin is treated, but the pores as well. When treating an existing infection, make sure to thoroughly apply the cream in between the toes as well. If the infection has survived four weeks of the treatment, it should be shown to a doctor. Due to the inclusion of certain allergens in the formula of Generic Lotrimin Clotrimazole Anti-Fungal Cream USP, some users may experience skin irritation and rashes after use. The substance should also be kept clear of one’s face, with extra care paid to the eyes. Children under the age of 2 should not be treated with Generic Lotrimin Clotrimazole Anti-Fungal Cream USP due to their sensitive skin, unless explicitly instructed to do so by a doctor. When purchased through Amazon, a double pack of 1.oz. Generic Lotrimin Clotrimazole Anti-Fungal Cream USP tubes cost $7.98, which is fairly low. Prices may vary when buying from other sellers. Since the manufacturer does not handle the distribution of Generic Lotrimin Clotrimazole Anti-Fungal Cream USP, there is no universal guarantee policy. Rather, each seller has their own policy. Generic Lotrimin Clotrimazole Anti-Fungal Cream USP is an effective product with a decent list of ingredients and a great price, but ultimately the risk of side effects and the lack of a guarantee means we suggest looking for a different product. Jimmy Rodriguez	reviewed Clotrimazole Anti-Fungal Cream USP	on June 10th	 and gave it a rating of 2.5.